Right before coming home we went to Mysore to attend a pooja for Ashwin’s cousin Sila. It’s something that is done around the time of a child’s first birthday and is for health and long life. Ashwin was a bit jealous of the attention Sila was getting, and Autie Vinuta invited him to take part with them. 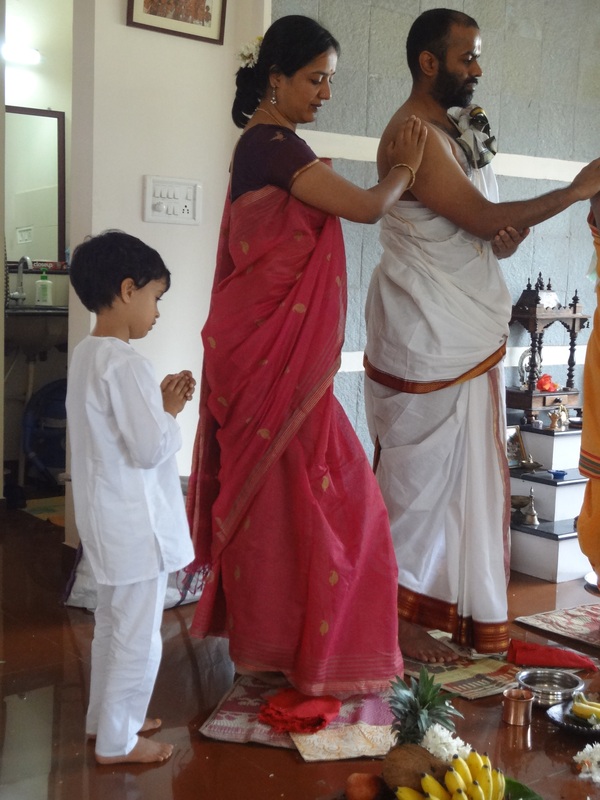 Ashwin sat up front with her and was so entranced by the whole process, he watched intently and even put his hands together without being told. Everyone commented on how sweet and well behaved he was. Nice to hear considering all of the bad behavior we had been having lately! He was really trying hard to be his own person, apart from Mummy and Daddy, while he was in Bangalore and it was very hard to tolerate at times. Ashwin took to the priest very quickly. They sat and had conversations before and after the pooja. 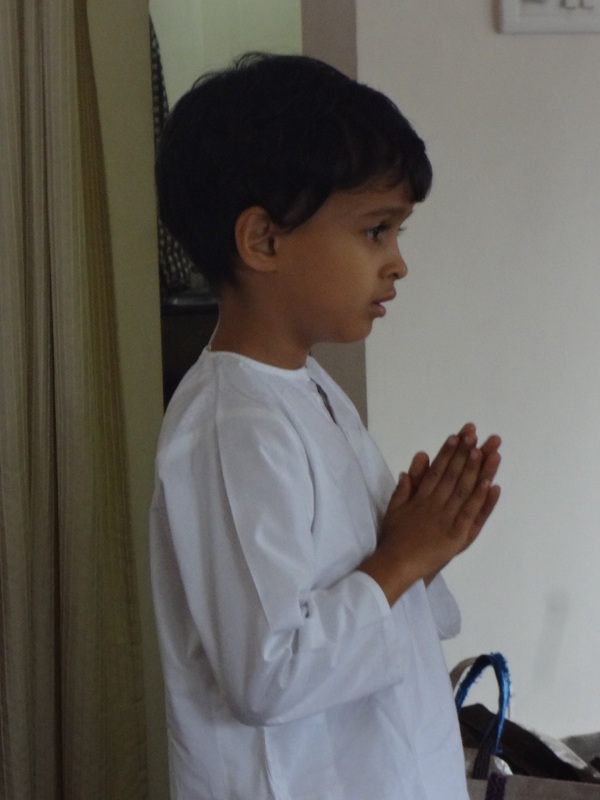 He said they talked about his school, but that night when we went home he started to sing shlokas (Hindu chants) all on his own. We didn’t know he knew them! 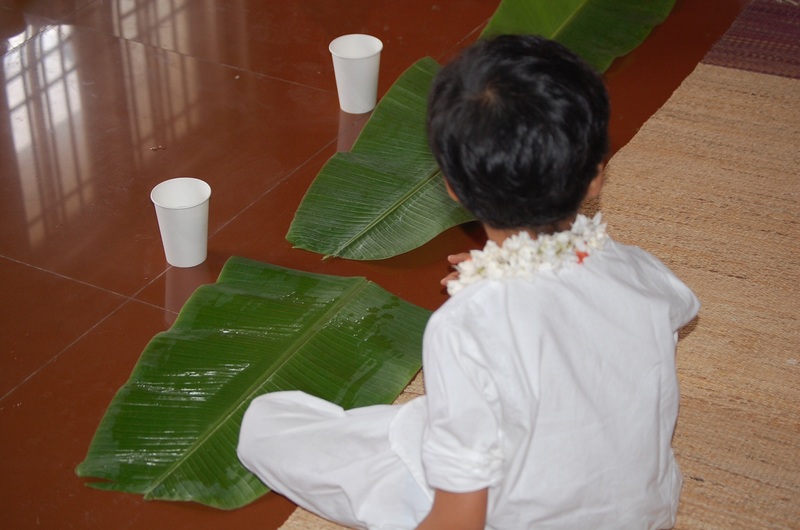 Afterwards he had a traditional meal on a banana leaf, South Indian food eaten with the hands. 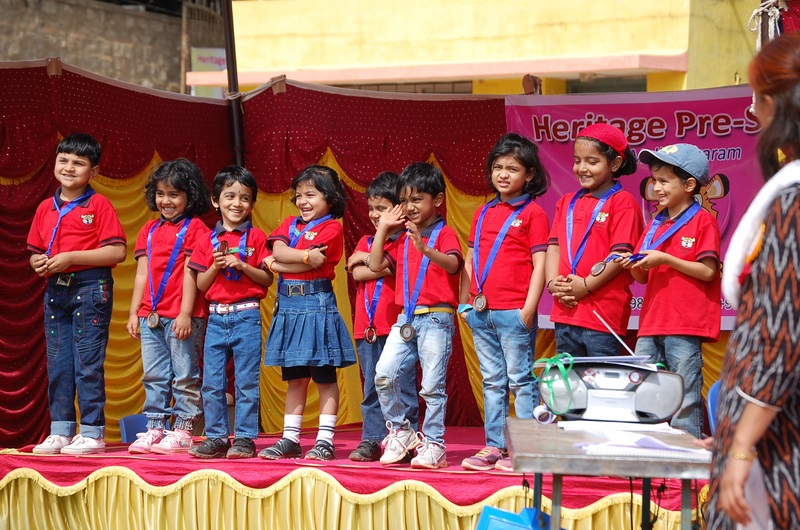 The day before leaving Bangalore, Ashwin’s school – Heritage Kids, had Sports Day. 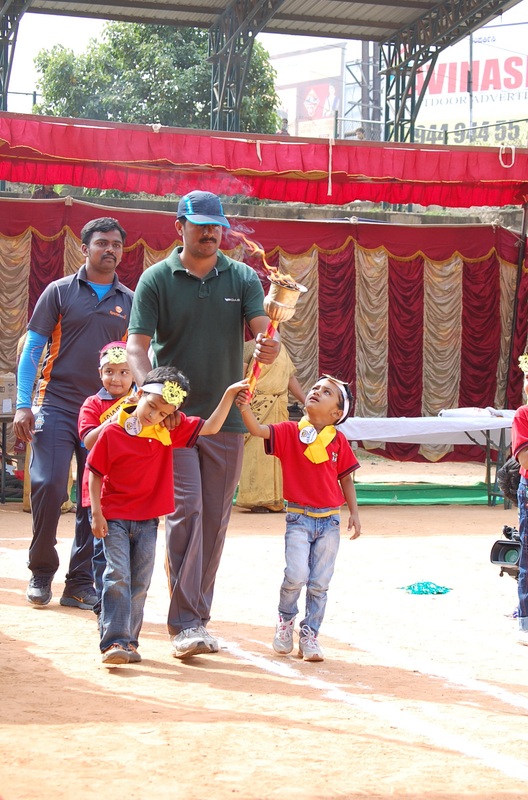 They had been training for it for over a month and Ashwin was going to be the one to hold the torch at the beginning of the games. Upon arrival he got very nervous and absolutely refused to participate. At the last moment we got him to stay up front and he and his friend Yushu were led around the sports ground with the torch. As always, when he doesn’t want to do something he pretends to sleep. So the man in charge of sports day had to hold his shoulder and push him around while he snored with his eyes closed. In the end he won the lime and spoon race and stood up on stage to receive his medal with all the kids in his class. 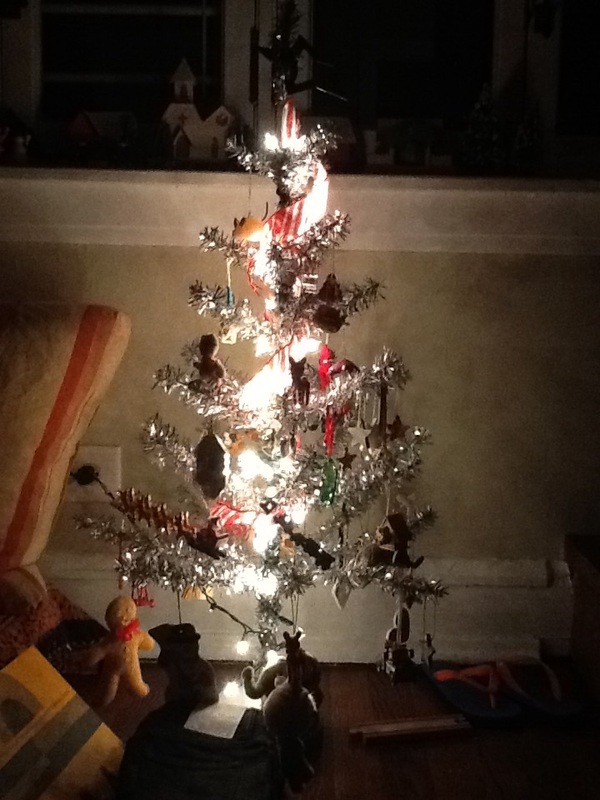 Once home, we did celebrate Christmas. 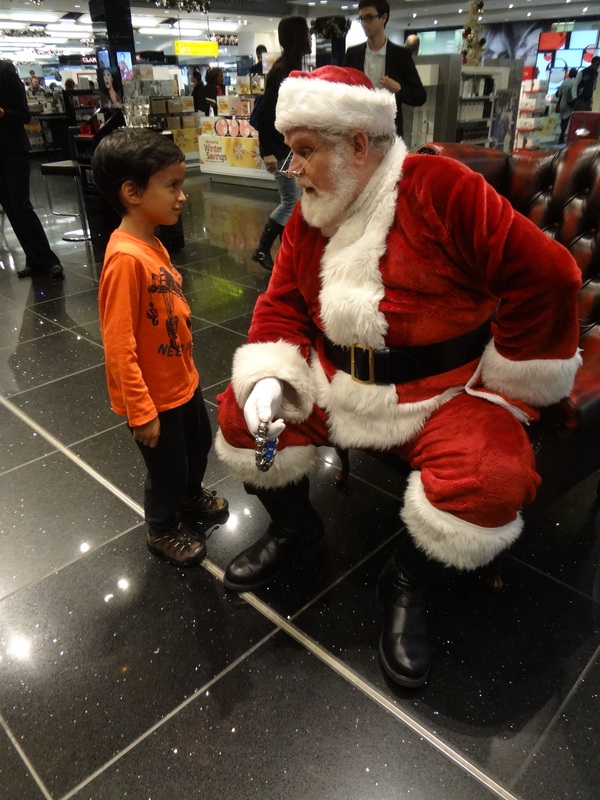 The Santa at Heathrow was hard to resist and we stopped to tell him where we would be on Christmas Day. And now that we are home again, we are settling into this strange and quiet life. I love my hot shower and I’m so happy to escape the ants, but somehow everything seems a bit duller here in this Chicago winter. 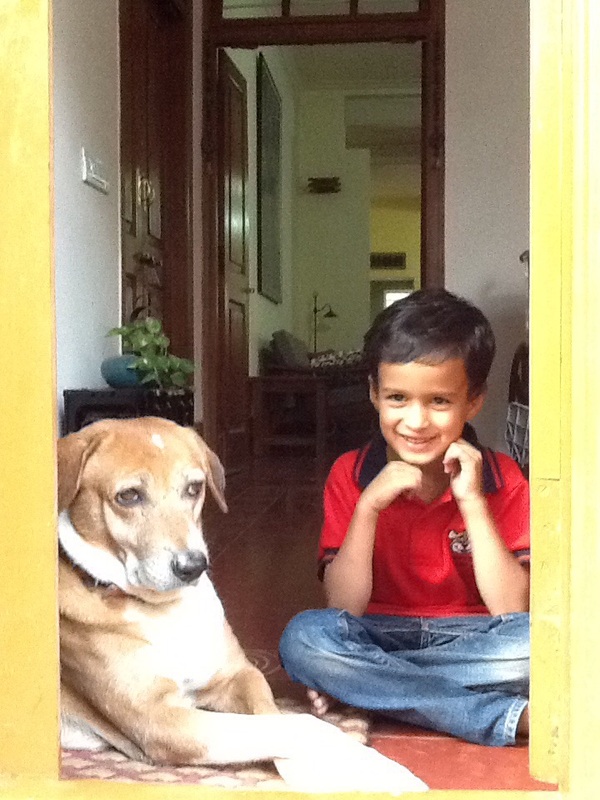 We all miss Bangalore very much and Ashwin misses Tata’s dog, Bubble, the most! I think he may be waiting still for Ashwin to come downstairs to go to school.